After the signing of the Treaty of Waitangi, William Hobson purchased land at Okiato to establish the country’s first capital. When the capital was moved to Auckland in 1841, the settlement at Okiato burned to the ground. Okiato was called Russell in 1840, but later the name was transferred to Kororāreka, 7 kilometres north. 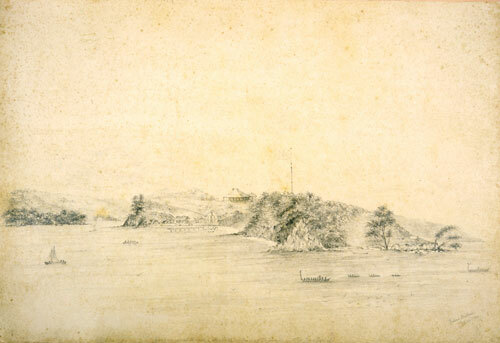 This view of the capital was sketched by Felton Mathew on 6 April 1840 and shows Government House, which was occupied by Hobson.